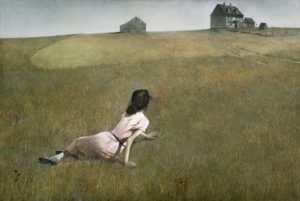 Andrew Wyeth, Christina’s World, 1948, tempera on panel. The Museum of Modern Art. The walk-in price for individual classes is $35 members / $40 non-members. Friends/family/colleagues are not allowed to take your place should you not be able to attend class. In paintings, sculpture and photography that remain both timeless and modern, this art lecture series will present leading artists who have had a profound impact on the art of the 20th century. From more traditionalist painters like Andrew and Jamie Wyeth to pop artists Larry Rivers and David Hockney, figurative painting will evolve and be dramatically transformed. 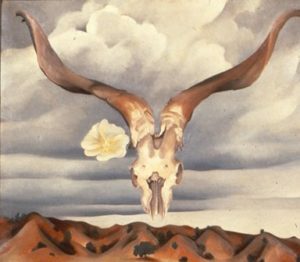 Georgia O’Keeffe, Ram’s Head White Hollyhock and Little Hills, 1935, Brooklyn Museum, New York. The old and new West will be seen in landscapes and subjects immortalized by photography master Ansel Adams and painter Georgia O’Keeffe in contrast to the abstract urban views of painters Richard Diebenkorn and minimalist Ed Ruscha. The impact of Abstract Impressionism, which will radically transform modern painting, is presented in the vibrant brushstrokes of Helen Frankenthaler and the figurative expressions of William de Kooning and Francis Bacon. Artist Frank Stella will design his canvases in hard edged shapes of color and form, while Jasper Johns creates new iconic images of the familiar transformed by thick encaustic paint over collage. New ways of conceptualizing and creating sculpture will be created by artists as diverse as Alexander Calder, Claes Oldenburg, Henry Moore, Barbara Hepworth, and George Segal. The lives and seminal works of these artists will be explored and presented in both images and videos revealing some of the most influential art in recent history. Weekly class will be held in the auditorium of the Lyman Allyn Art Museum, 625 Williams Street, New London. Advanced reservations required for the series. Please contact the Education Department at 860-443-2545 x2110 or email us. Bob Potter is a graduate of Syracuse University’s School of Visual and Performing Arts. 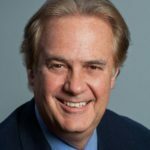 He spent his early career as a creative director at major media companies including Scholastic Magazines, Time Warner, National Geographic and in corporate development at the National Gallery of Art. He has managed an art therapy program for Save The Children, marketing for Mystic Seaport, professional development for students at the Lyme Academy College of Fine Arts, and is a docent at the Yale Center For British Art. He and his wife Jeanne, who is an artist, live in Old Lyme, Connecticut.